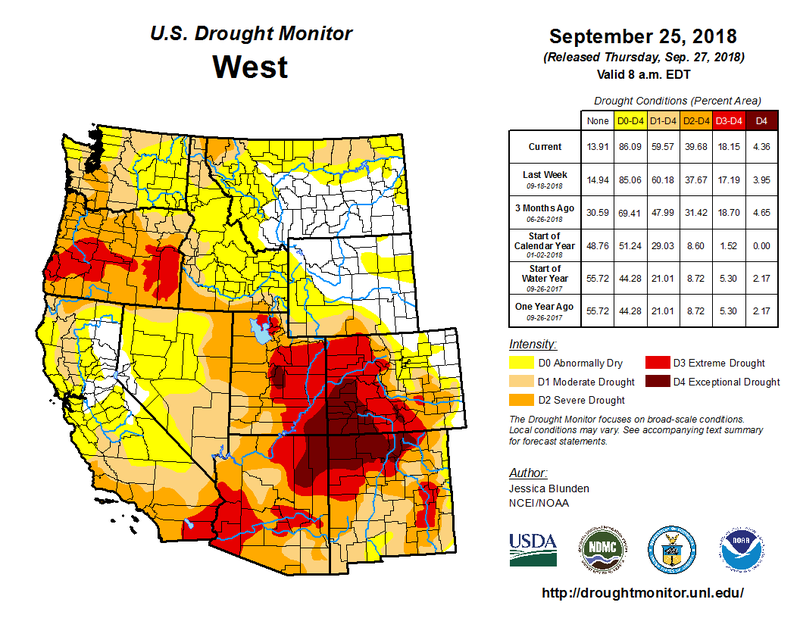 West Drought Monitor September 25, 2018. According to the U.S. Drought Monitor all of Rio Blanco County is still currently classified as D3, or Extreme Drought, as precipitation around the county continues to fall well under normal rates. However, there is some hope to be found in the winter forecast. The National Oceanic and Atmospheric Administration, or NOAA, has been tracking weather and climate related data in Rangely since 1894. The station currently sits near the Rangely Water Treatment Plant. According to NOAA data, by the end of August Rangely was 1.37 inches below normal precipitation, receiving only 6.22 inches from January through August. In 2017 Rangely received total precipitation of 8.66 inches for the entire year while the historic average total annual precipitation sits at 10.03 inches. NOAA predicts that the below normal precipitation will continue through the rest of September. The fact that precipitation has been well below normal for multiple years has certainly exacerbated the drought conditions. NOAA tracks Meeker’s climate and weather at a station located at the Bureau of Land Management Office. Meeker is currently below normal for precipitation by 0.81 of an inch, receiving 9.16 inches through the end of August. The good news is that the National Weather Services’ Climate Prediction Center (CPC) is anticipating an El Niño episode for the upcoming 2018-2019 winter season, with odds favoring at least near normal precipitation in northwest Colorado during the late fall, winter and spring months. An El Niño event is characterized as bringing unusually warm waters in the Pacific Ocean. 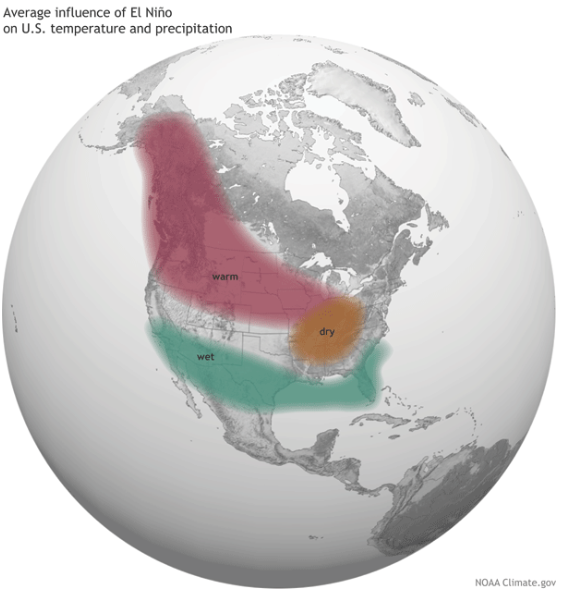 This typically produces warmer-than-average temperatures over the western and northern United States. Wetter-than-average conditions are likely over portions of the western U.S and Gulf Coast regions, while drier-than-average conditions are usually expected in the Ohio Valley and the Pacific Northwest.